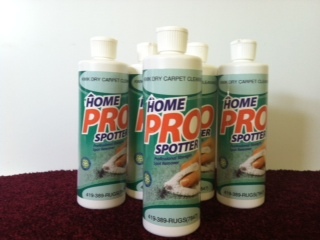 Purchase a bottle of our spotter to help protect your carpet from the possible permanent damage that could come from spills. No one plans on spills and sometimes family members spill or pets urinate and the spill isn’t noticed right away which could permanently damage carpets. Spills need to be cleaned up right away. Many store bought cleaners leave a residue…..ours doesn’t. Call us for our Spring specials!